It was in the year 1949, precisely ten years ago, that the author of this book found himself in forced liesure and detention at Shimla to which place he had come on two months' holiday. Circumstances lengthened this stay into a semipermanent one and his peculiar situation encouraged and necessitated long walk for which the Shimla parts of the Himalayas offer such wonderful opportunities. Long walks are good for making the ruffled mind tranquil and a tranquil mind faced with a crisis when the routine of life is suddenly upset, when the habitual adjustments are broken, and when one is turned into a floatsam of a disadjusted and displaced person, asks fundamental questions and seeks satisfying answers to them. "The Sikhs' Religion and its practices originate from the teaching of Nanak, who founded their new Religion. Gobind Singh, who was a successor of Nanak, conferredupon them the title of 'Singh', and thus the Sikhs became the Singhs, the Lions. These dogs are not Hindus by religion or persuasion. These evil-doers have a Way of life, entirely different" . Although the author had not made this quotation in support of any thesis about the nature and status of Sikhism vis-a-vis Hinduism, for, the subject of talk was foreign writings as sources of Indian History, yet Sri Parasher reacted sharply towards this appraisal of Sikhism by Qazi Nur Mohammed, and wanted to know, why was this foreigner interested in dividing Sikhism from Hinduism and consequently, the Sikhs from the Hindus. It was in answer to this question that the main thesis of this book took shape during many long walks and talks spread over. a period of almost a year and a half. In the: beginning of 1952, the main body of the book as it appears now in print was. written down, primarily at the request and for the personal use of Sri Parasher. Sri Parasher is an exacting questioner, and once in about every couple of months he used to find time from his own all- engrossing duties to meet and question the author on some point arising out of the main thesis of this book, the type-script of which he all along had in his possession. 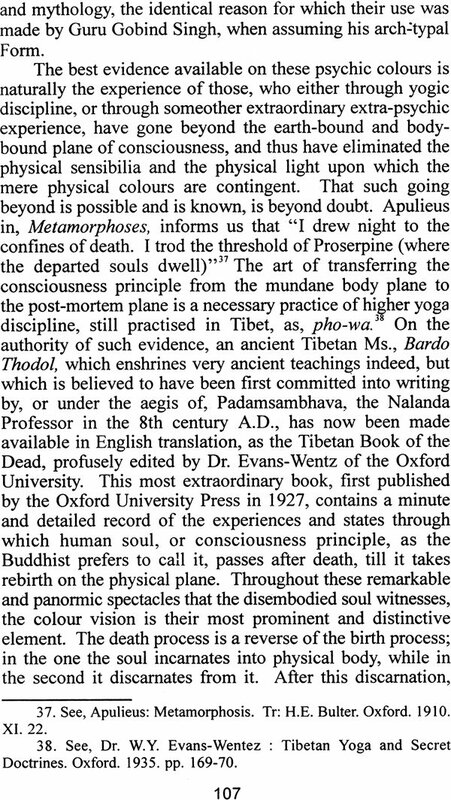 The twelve Appendices which now form an integral part of this book thus developed and eventually came to be written down, like the main thesis. It was in 1954 that this book, as it is, was completed, and ever since it has been with the Publishers and in the hands of the Printers, who the later, are responsible, in an active sense, for making changes in the body of the book such as are only incompletely indicated in the considerable errata attached. It is for the author to apologise to the reader, not only for the unplanned and fortuitous character of the subject matter of the book but also for its faulty production. The one he could help but had no time to rectify, and the other proved to be literally beyond his control. If and when there is to be another edition, the author hopes to remove both these blemishes. "The intensity of an alien intelligentia's hatred of the Western Middle class gave the measure of its foreboding of its inability to" emulate Western Middle class achievement. The classic instance, up to date, in which the embittering prescience had been justified, was the Russian intelligentia's catastrophic failure, after the first two Russian Revolutions in 1917 to carry out its fantastic mandate to transform the Wreck of the Petrine czardom into a parliamentary constitutional state in the 19th century Western style. The Kerensky regime was a fiasco because it was saddled with the task of making bricks with straw, of making a parliamentary government without having a solid, competent, prosperous and experienced Middle class to draw on. By contrast, Lenin succeeded, because he set himself to create something which would meet the situation . : His All Union Communist Party was not, indeed, a thing entirely without precedent. In Islamic Muslim History it had been anticipated in the slave household of the Ottoman Padishah, in the Qyslbash fraternity of devotees of the Safawis, and the Sikh Khalsa that had been called into being by a decision to fight the Mughal ascendency with its own weapons. In these Islamic and Hindu fraternities the ethos of the Russian Communist Party is already unmistakably discernible".' It became necessary for the author to explain to Sri Parasher at length as to what was the true character and ethos of the slave household of the Ottoman Padishah and what was the origin and character of the Qyslbash fraternity which made extreme sacrifices to uphold that national Safawi dynasty of Iran (1499-1736), and how the ethos in the case of both of these is fundamentally different from the true ethos of the Order of the Khalsa, of which ethos the Russian Communist Party unmistakably partakes. In the case of the slave household of the Ottoman Padishah, the loyalty of the former was wholly actuated by the knowledge that their position and material interests were inseparably bound up with continuation in power of the latter. The essence of their ethos is, therefore, enlightened self-interest, pure and simple. In the case of the Qyslbash loyalty towards the kings of the Safawi dynasty, the motive-base was communal gratitude and patriotism. Communal gratitude, because the Qyslbash had for their nucleus, the descendents of those Georgians who had been rescued from captivity of Timur, when taken as war prisoners in wars with Beyzid, through the intercession of the pious Sufi, Sheikh Saifu' Din Izhak and it was a great grandson of the Sheikh who founded the Safawi dynasty, by assuming the royal title of Shah of Persia in 1499, as Ismail I. Besides, the Safawis were truly, in origin and spirit, Persians, which inevitably invoked national and patriotic sentiment in their favor, such as animated the Qyslbash fraternity. 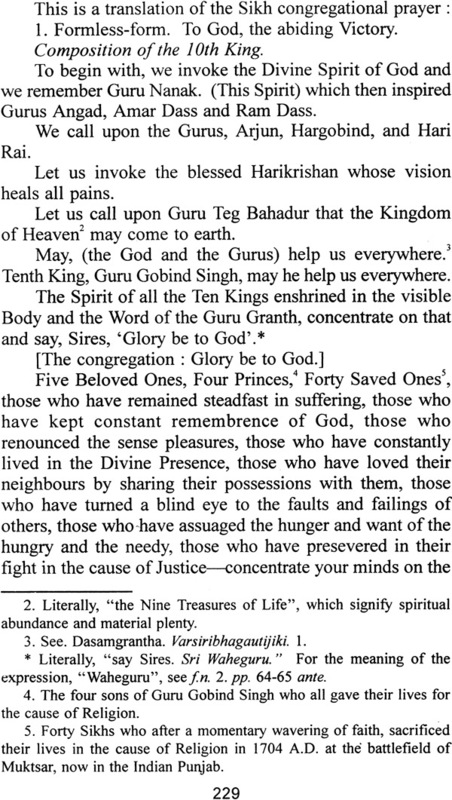 This is not to be confused with the deathless pledge and loyalty of the Khalsa to a universal Idea and Ideal, for the upholding and propagation of which the Khalsa is sworn to a dedicated life on this earth. It is something of this ethos which has inspired the Russian Communist Party of Lenin, and the Order of the Khalsa is, therefore, the latter's true prototype. 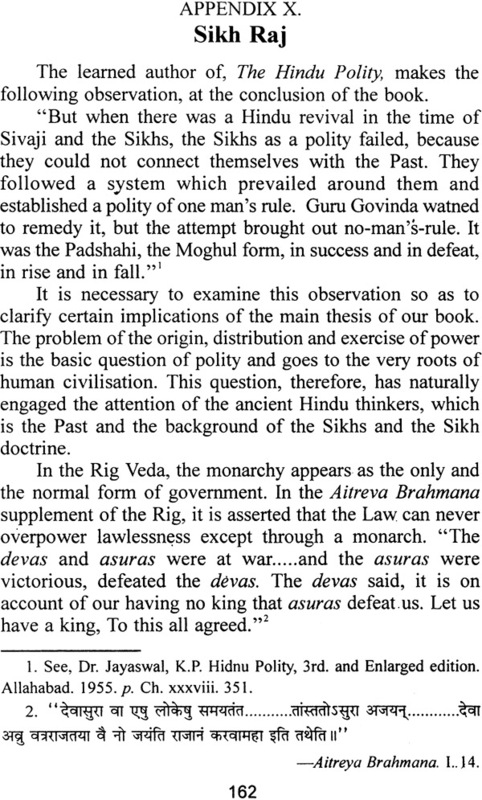 Lenin's view that, his Party is an exception in the history of human societies, was mistaken, as is the view of Arnold Toynbee that the creation of the Order of the Khalsa was a contingent phenomenon dictated by the exigencies of the moment, for, it was a logical development and entelechy of the teachings of Guru Nank revealed in certain sutras of the Japu itself and fighting the Mughal ascendency was an accident and not a cause. 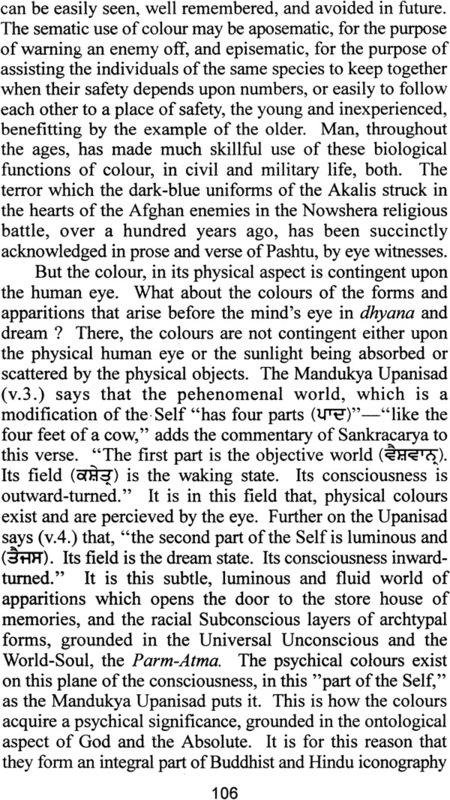 Sri Parasher frankly confessed that it was for the first time that he had listened to the author's such expositions of Sikhism with a mind completely free from scepticism, and that previously, the author's ideas had always struck him as mostly newfangled. Such is the 'well deserved prestige which European scholarship enjoys in India. Remains .it now for the author to record his thanks to Professor Pritam Singh, M.A., of the Mohindra College, Patiala, who not only found time from his multifarious duties and preoccupations to prepare the Errata and the Index but also otherwise encouraged him to let the book see the light of the day in its present unkempt form. Dr. Mohan Singh, M.A. Ph. D., D. 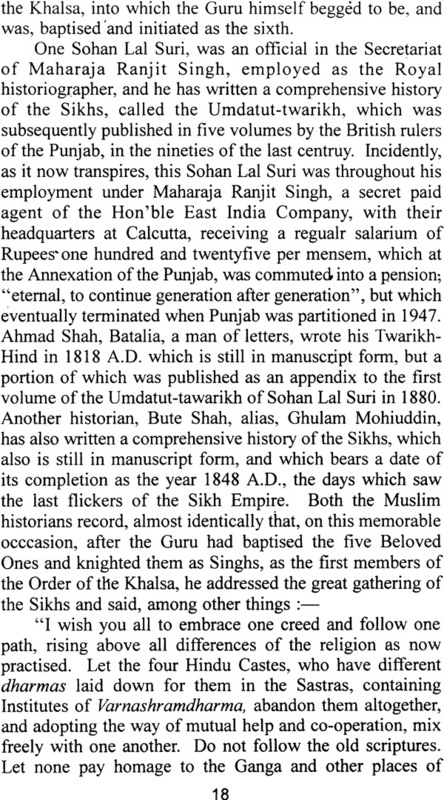 Litt., Head of the Punjabi Department of the Punjab University, Chandigrah, is well reputed for his learning and scholarship but his generosity of disposition is not so well known. The author feels honoured by the fact that Dr. Mohan Singh, has condescended to permit his name to be associated with this book, as its introducer. Parasharprasna. the name of this book, meaning, the Questions of Parasher, is appropriate enough in view of the way this book came to be written, though there is no intention to suggest any comparison with the world famous Pali book, Malindpannha of the incomparable Nagsena. Its subtitle, The Baiskhi of Guru Gobind Singh, being the earlier of the two suggestions has also been retained for obvious reasons. Neither the author, an intellectual gaint, nor this book, a tour de force of living adoration of the Master and a sincere and balanced and frank appraisal of the historical evolution of Sikhism, needs any commendation from anyone. If all the same, I am going to say something, it is only to express my own gratitude and that of our community for this work and to lend the weight of my own humble thinking and research to his mature considerations. Sardar Kapur Singh, whom I have known since 1930, has had a very brilliant academic career. He got a first class first in philosophy from the Punjab University, Lahore, and a Tripos in Moral Sciences from Cambridge with first position. In addition, he is a very sensitive original poet in Punjabi. Independence of thought and action has been the hall- mark of his life and for this he has suffered in plenty like myself, if I may be parodoned for making that confession in public. The Sikhs have been described by non-Indian observers as a separate nation, almost a separate race and Sikhism has been described as a spiritual republic, a spiritual democracy, military democracy, by competent Western writers. To me, membership of the Order of the Khalsa is a prize which has to be won by an initiation which demands both saintliness and heroism, selfless public service as well as individual moral excellence in the candidate for initiation. 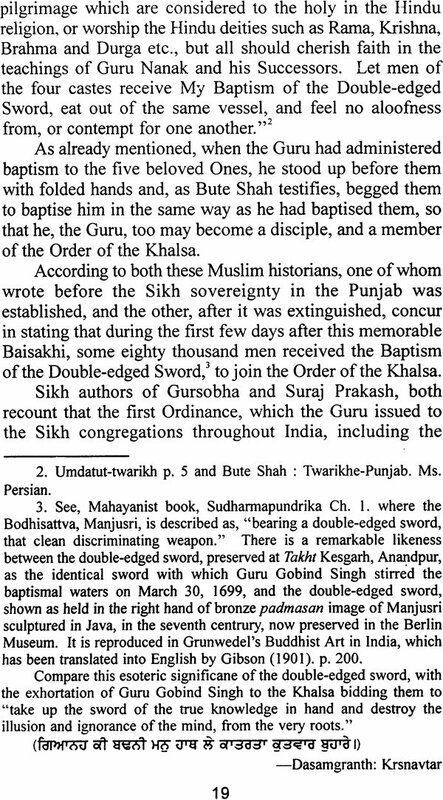 In the first chapter, the author gives the dual esoteric and exoteric significance of the double-edged sword which Guru Gobind Singh used at the first initiation of the five candidates into his Order of the God's own, and states boldly that this Order claimed at its birth to be a new Way of life, the third Panth, a distinct people. 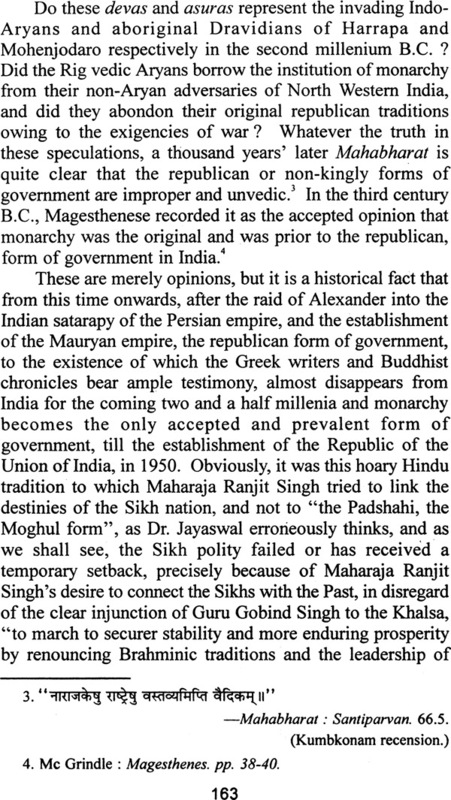 He quotes Sir Charles Eliot, who says that, Guru Gobind Singh's ordinances were successful in creating a tribe, almost a nation. 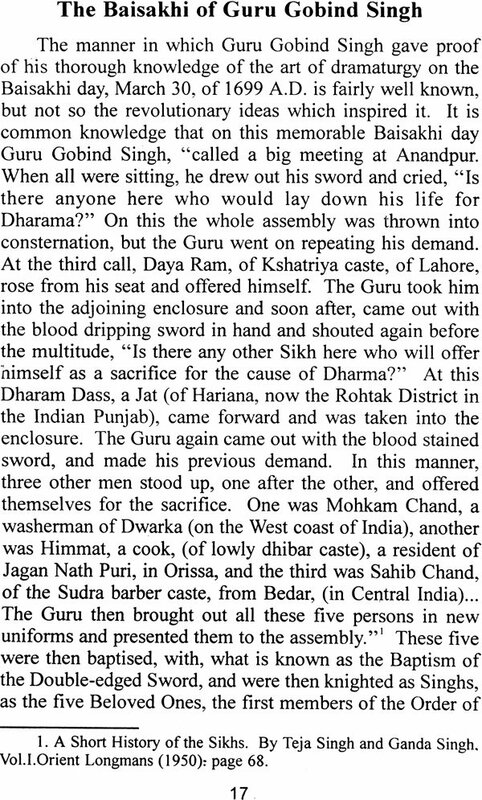 Singificantly, the actual names of the first five initiaties are miraculously symbolic, they being, the Lion of Dharama, the Lion of Daya or Compassion. the Lion of Heroism, the Lion of Imperturbability and the Lion of Self-mastery, the last three first names being Persian. Another bit of fresh information, in connection with the Vaisakhi initiation ceremony, is that the great Guru, on each of the five occasions with in the tent handed over his own sword to the candidate and as a trial asked him to use it on the goat before him. In more than three manuscript copies discovered by me, this fact is prominently stated. In Appendix on, Sarder Kapur Singh has undoubtedly sounded very deep depths and correlated Sikh initiation rite and ceremonial to the ancient Indian Shaiva and Buddhist, Vedic and Muslim initiation ceremonies, initiation objectives and initiation pre-requistes. 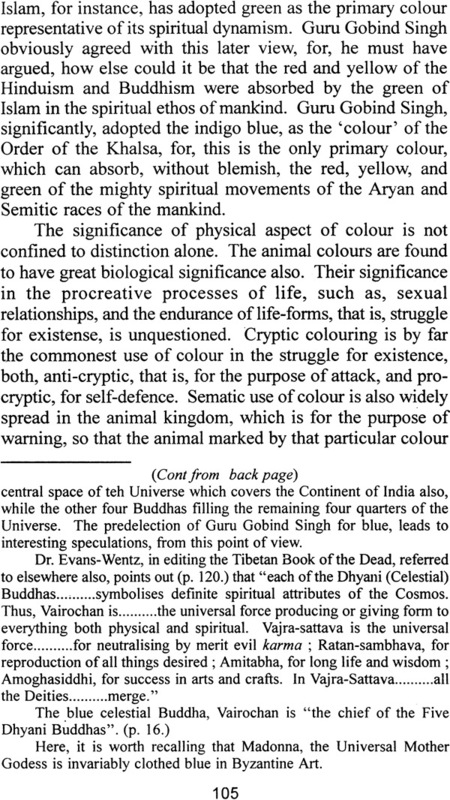 In Appendix two, references are made to the hymn of Man in the Rig-Veda and to Swedenborg's theory of correspondence which dates back to Egyptian and Sumer cultures. The author is at his best when the unveils the symbolic value of the hair and points out the reasons why the Guru forbade shingle and shaving, and only an inspired lover could have said, "The reasons why the Guru fobade shingle and shaving are grounded in the metaphysical postulated of transcendental aesthetics". 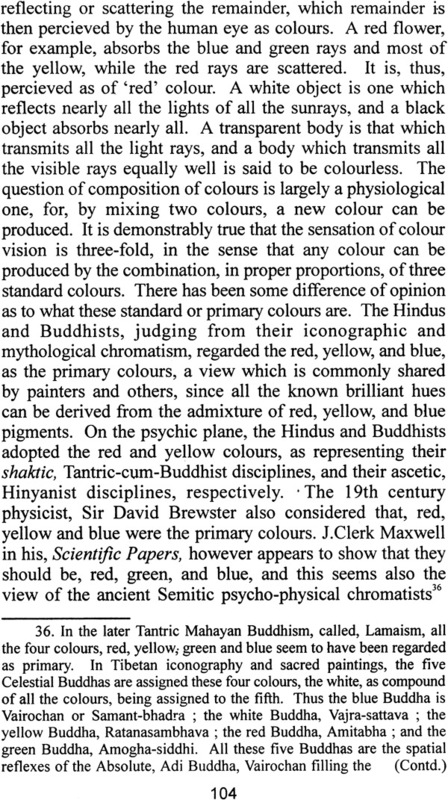 Appendix three, deals with the commandment, "Thou shalt not smoke", and Appendix four, gives the inner mental equivalents of the remaining three Kakars. 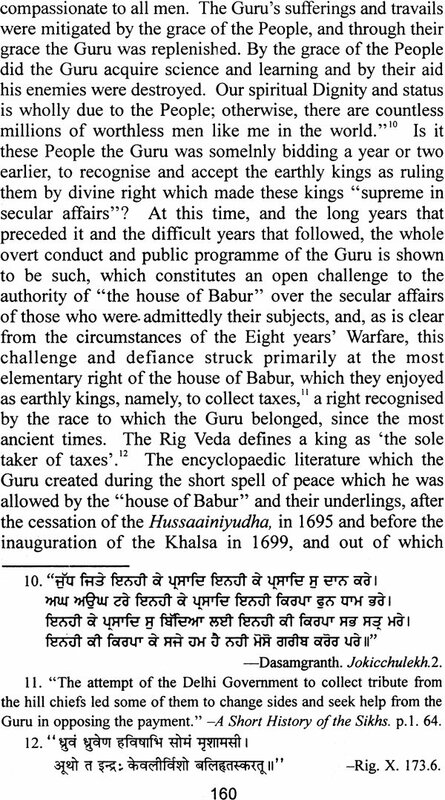 Here, too, the author has traced the ancestory of the Guru's three other commandments. In discussing the Archtypal Form of Guru Gobind Singh, of which dark blue clothes, pure steel armour, the lance, the white hawk, the jewel aigrette and the dark blue horse are the most significant, the author has almost excelled himself and I bow to him for the vast range of his comparative study of world mythology and world religions. I do not indulge in an hyperbole when I say that I have come across this range and this profoundness in very few modem Indian writers. Appendix seven, is a monument of Sarder Kapur Singh's spiritual wisdom. 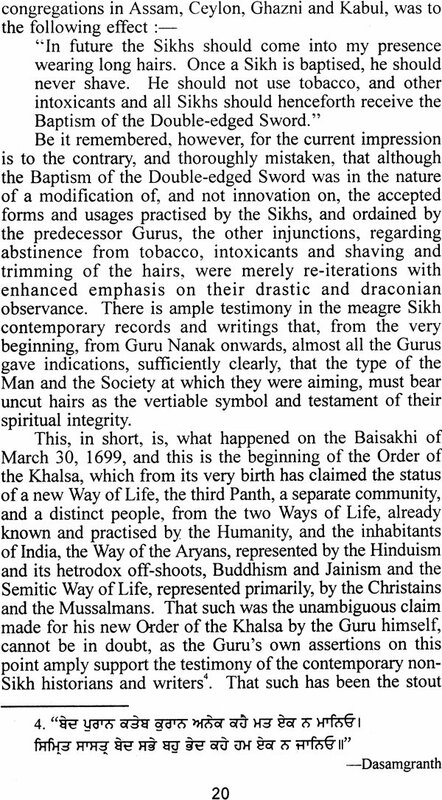 Under the heading, "Parthenogensis", the significance of the steel- strirred and sugar sweetened water used in Khalsa initiation is laid bare most convincingly. 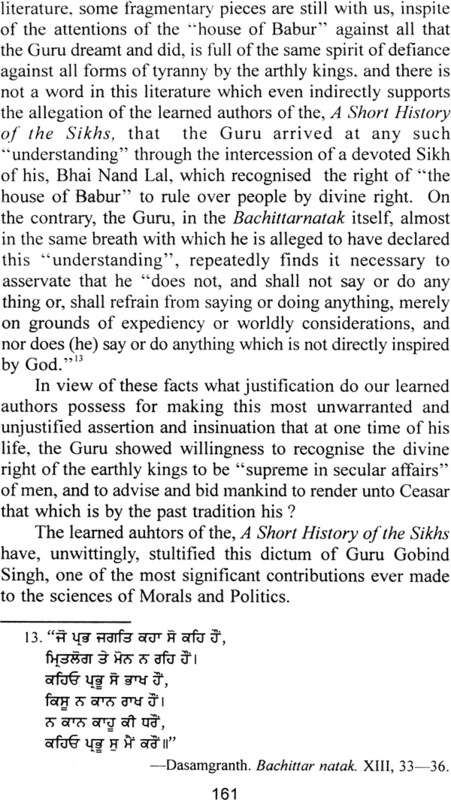 The author is to be congratulated, for amongst other things, pointing out several bits of incorrect history and unwarranted interpretations in, A Short History of the Sikhs, by Teja Singh and Ganda Singh. A good deal in the chapters on, "Sikh Raj" and "The Hindu Caste System", is matter about which more than one historical interpretation is possible but there is no room, no ground either for factual contradiction or for an allegation of bias. 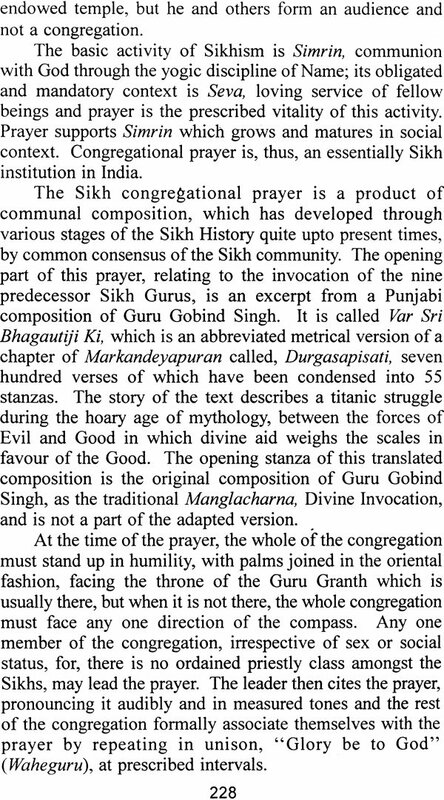 The chapter on Sikh Congregational prayer, including a most brilliant English rendering of the text of the prayer, must gladden the heart of every Sikh and strengthen his faith in the miracle working power of congregational prayer and worship, which is the pivot of Sikh social, political and spiritual living. Let me end with the hope that Sardar Kapur Singh's memorable contribution will receive the homage it amply deserves from all students of comparative study of Religions in all parts of the world.